An RV Kitchen Remodel You Have to See to Believe! Come on in and tour our RV kitchen remodel reveal, featuring beautiful and functional open shelves, hexagon tile backsplash, butcher block counter tops, and a pretty and practical copper sink! A special thanks to Urban Floors, Sinkology and Cascade Iron Co. for providing products for this space! I have been sharing the progress of this RV kitchen makeover on my Instagram stories (be sure to follow me over there for daily updates and to see behind the scenes), and I am SO excited to finally be revealing this space here on the blog! Yay! Note: all sources are listed at the bottom of the post! The kitchen layout wasn’t very functional and felt really bulky with the large upper cabinets and awkwardly angled sink. Across from the fridge is where the floor to ceiling pantry used to be with a single door that opened toward the kitchen area. For an RV, this kitchen wasn’t the worst. But we knew we could simplify the layout, add more storage AND make it pretty in the process. Ready to see what this space looks like today? Our RV Kitchen Remodel Reveal! By simplifying the cabinet layout and adding open shelving, we were able to create a light and airy feel without compromising functionality. Since we reworked the kitchen layout we ended up replacing all of the existing cabinets with basic white cabinets from Home Depot. We purchased them unfinished and painted them ourselves so they blended perfectly with our white walls. We added some modern bronze pulls to the cabinets to give them a finished look. Since we chose white cabinets for our RV kitchen makeover, I was excited to add a pop of rich color to the space with a copper sink. And boy does this beauty pop! ? We picked the all-in-one kit that came with a gorgeous Pfister faucet in antique bronze. The high goose-neck design makes it super easy to rinse dishes and easily spray out the sink. We have been using the sink for about a month now and are completely obsessed! This was a MAJOR upgrade from the tiny shallow RV sink. It’s already starting to get a beautiful patina in some spots which I love! While some people view the natural discoloration that happens with copper as a negative thing, I love the unique one-of-a-kind story it tells. One of my goals with this RV kitchen remodel was to step out of my comfort zone and make design choices I may not otherwise choose. Our butcher block counter tops was one of these choices. I’ve always LOVED the look of butcher block in the kitchen with it’s warm natural tones. But keeping up with the maintenance has always scared me! So far, the maintenance hasn’t been too bad. We keep them sealed with butcher block oil and are extra mindful to use coasters and trivets whenever necessary. I plan to do a full review with my thoughts on whether or not I’d do it again after living with them for a few months. Since we chose a park model RV, we were able to install full residential style appliances. We replaced the original fridge with a stainless steel french door model that also has a full freezer. We opted to replace the oven/range combo with a sleek induction cooktop and convection style microwave instead. This freed up space to even add a dishwasher! Now we have the best of both worlds: no washing dishes by hand AND oven baked cookies whenever we want! Yippee! When we ripped out those bulky overhead cabinets, I immediately envisioned open shelves taking their place. I love that open shelving can be both stylish and functional, and really open up an entire space. The shelves are where we keep all of our every day dishes. Since our RV will be parked full time, we don’t have to worry about securing all of the items on the shelves. I kept it simple with all white dishes and mason jars for glasses. 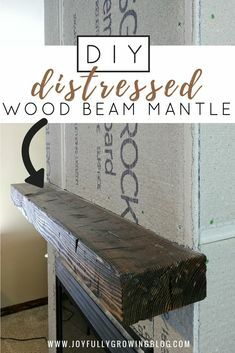 The shelves were an easy DIY project using two 1″x12″ pine boards stained with a mixture of Minwax Early American and Minwax Golden Oak. They are mounted to the wall with black L shaped brackets from Cascade Iron Co. and lag bolts. We also added under cabinet light bars that we adapted to mount under each of the shelves. These low profile light bars are great for areas where they are exposed. You can hardly notice they’re there! An LED strip light runs along the top of the upper shelf to provide extra lighting at night. For the backsplash we chose a simple hexagon pattern in matte white that we finished with a premixed grout in off-white. The design adds dimension to the space without being overwhelming. Although the shelves are mostly filled with dishes and kitchen items, I couldn’t help but add a little reminder of Montana with one of my favorite scented candles in the scent ‘Montana Forest’. Oh how I wish you could smell this thing through your screen! SO GOOD! …and placed a roll of paper towels next to some greenery inside of an old wood crate. Remember that original pantry with the long skinny mirror? We reworked that whole space and transformed it into a much needed coffee bar! We installed matching upper and lower cabinets here that house all of our pantry items and coffee supplies. For some added texture, we installed shiplap planks to the back wall and painted them white. Bronze cabinet pulls and a butcher block counter top helped make this corner feel cohesive with the rest of the space. We are thrilled with how this little coffee bar turned out! 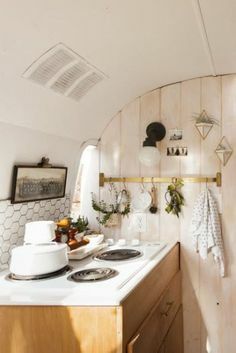 Our RV kitchen brings us so much joy. This little area is where we spend the majority of our time and it was so important to us to create a space we loved. With a little creativity we were able to design a tiny kitchen with all of our must haves, and for that I am so grateful! I’d say we enjoy cooking in here, but Mike is the one who does most of our cooking. (I know, I hit the husband jackpot!) So instead, I’ll just say that I sure do LOVE the view. ? See how I dressed up our small dining area for Thanksgiving here. 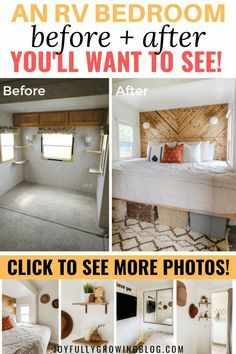 I’ve linked all of the sources below, but first let’s look at some before and afters! Thanks for following along! Be sure to leave any questions or comments below, I love hearing from my readers! WOW!!! This makeover is gorgeous! You all did an amazing job! Y’all did a wonderful job!! I love this more than most peoples full size kitchens! That is so sweet of you to say, thank you Laura! Hi Ashley. I love all your design choices- they’re an inspiration to me for my park model remodel. 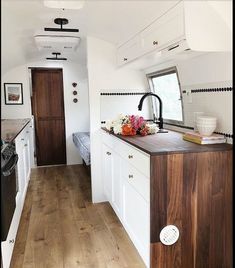 I was wondering how you were able to tile the rv walls in the kitchen. Did you have to use a special adhesive to get them to stick to the walls? Hi Dawn! Thank you for those kind words! We decided not to go with the flexible mortar options that most RVers use, since we don’t plan on moving our RV around much (being a park model). We used regular mortar in white to apply the tiles to the wall and then grouted with premixed sanded grout. This is such a nice makeover and a great place for a staycation. I just stumbled on our site and am blown away by how talented both you and your husband are. We have a TT that we are thinking about redoing and I was wondering how difficult it is to replace the old vinyl flooring. Do you lay the new floor over it or take it up? Thanks so much and I will start following you going forward. Hi Dyanne! Thank you so much, you’re too kind! It probably depends on what condition your original floors are in – if they are gross, I would rip them up before installing new floors. But if they are in decent shape you could totally just lay the new floor right over top. Many RV renovators do this! Good luck! Thank you so much for sharing your beautiful renovation. We have a 2003 Layton Park Model TT that stays stationary on our land (similar layout to yours). We have just pulled up all the carpet and linoleum and have purchased sheet vinyl flooring that has a white/grey stone look to it. We were planning on laying the vinyl in two sections in the main living area – one on the main floor and one on the slide-out. It looks as though you ran yours all as one. 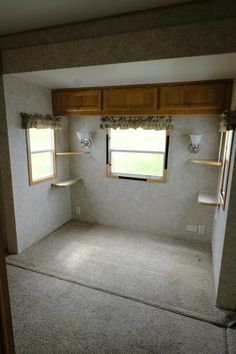 I would love to do this being we are not moving the RV and want to make it one level floor all around. Can you share what you did with your flooring across the main and on to the slide-out? Hi Lori, thank you so much for those kind words! And yay for fellow park model owners! 🙂 We achieved the seamless floor by laying 1/2″ MDF underlayment in the main area of the trailer and the slideout to bring both floors up to where there was no longer a seam – making everything level. We then layed click-lock plank flooring right over top. Hopefully that makes sense! Feel free to let me know if you have any other questions! Good luck!